Surface Solutions, Inc. is an award-winning industry leader in the installation of seamless resinous flooring systems designed for industrial and decorative applications. As a women-owned independent flooring contractor, Surface Solutions is a specialist in high-performance flooring for the food and beverage industry with Fortune 500 and name-brand companies as repeat customers. Headquartered in Indiana, we provide flooring solutions nationwide, with emphasis on Indianapolis; Chicago, Illinois; Cincinnati, Ohio; Louisville, Kentucky and the surroundings areas. We are capable of fulfilling any flooring need regardless of size and guarantee our concrete floor coatings will be installed efficiently, with the highest possible quality standards. We have built a reputation for completing successful concrete preparation and flooring installation with an exceptionally fast turnaround – accommodating your production schedule and employee or retail traffic with ease. 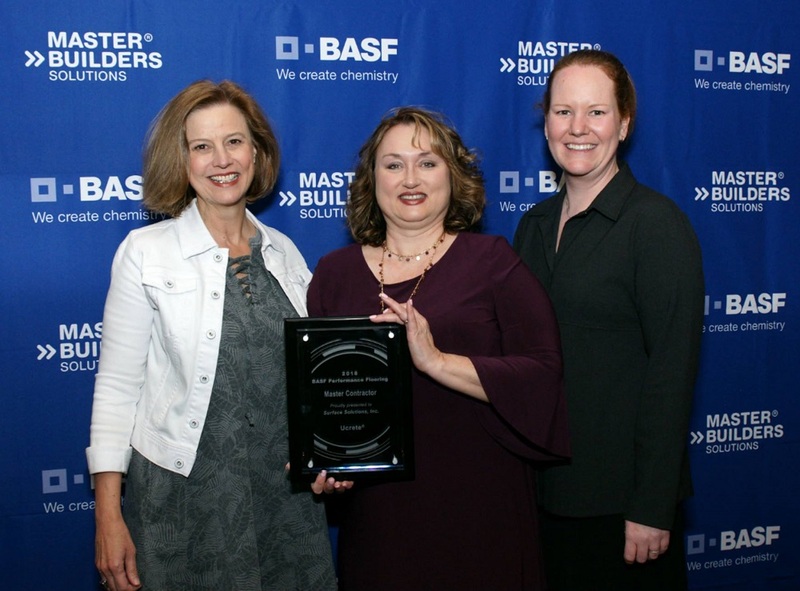 Surface Solutions is a recipient of the prestigious BASF Performance Flooring UCRETE® Master Contractor Award for seven consecutive years and counting. Top Ucrete Master Contractor status is reserved for only the best installers in the industry -and only a few flooring contractors in the United States- who consistently provide you with optimal flooring solutions and quality service in partnership with BASF. It’s a testament to the hard work, depth of knowledge and high standards of our consultants and installation teams. Surface Solutions also enjoys a mutually beneficial partnership with Flowcrete Americas as a Flowcrete STAR Contractor, after completing elite training on the latest resin flooring installation techniques, including cementitious urethane, methyl methacrylate (MMA) and other specialty resin chemistries, health and safety guidelines set out by the Occupational Safety & Health Administration, floor installation project management, installation proficiency testing and certification. We work with you to determine the specific challenges your work environment faces, conducting site visits, vapor testing and core sampling of concrete to access current conditions. We perform OHSA-compliant surface preparation prior to installation to ensure the flooring system that’s eventually installed is the best and the most long-lasting. We use a full line of non-toxic, safe and environmentally friendly urethane concrete and seamless epoxy flooring systems designed to create high-performance floors for your business. In addition to other top-name suppliers in the industry, Surface Solutions works in partnership with Sherwin Williams. The number one source for paint is also one of the largest floorcovering distributors in the United States, supplying top quality commercial, high-performance flooring systems and coatings. We include a single source warranty for both products and installation on all Surface Solutions floor and wall system installations. Floor after floor, we achieve a high level of customer satisfaction and repeat business. As one of the most experienced flooring contractors in the industry, Surface Solutions relies on a few of the most trusted names in concrete flooring to provide you with surfaces that are durable, long-lasting and aesthetically pleasing. UCRETE for the Food & Beverage Industry – Ucrete offers seamless flooring that is resistant to the harsh conditions found in the production and processing environments of the food and beverage industry. Flowcrete Flooring Systems – Flowcrete is recognized for its ability to deliver durable, hard-wearing floors that stand up to the demanding conditions in food and beverage processing plants, while fulfilling the highest government standards for hygiene in the industry. Epoxy Flooring for Demanding Industrial Applications – Surface Solutions offers hundreds of epoxy flooring systems to meet the demands of any industrial flooring application. Our epoxy flooring systems are aesthetically pleasing, durable and exhibit the characteristics necessary for high traffic industrial environments. USDA-Approved Flooring – Food and beverage facilities, as well as others, are required to adhere to strict guidelines set forth by the USDA. Surface Solutions is an industrial leader installing antimicrobial and USDA approved flooring with contamination fighting additives that inhibits growth of dangerous bacteria. Surface Solutions continually tests and verifies new products, equipment and methods that provide you with the flooring solutions you need to operate a productive, compliant and safe work environment. Raising the bar is what we strive to do. Take a look at successful Surface Solutions industrial flooring system installations by visiting our Work Showcase. Get a free quote from Surface Solutions and find out more about how you can start planning your high performance industrial flooring project today.